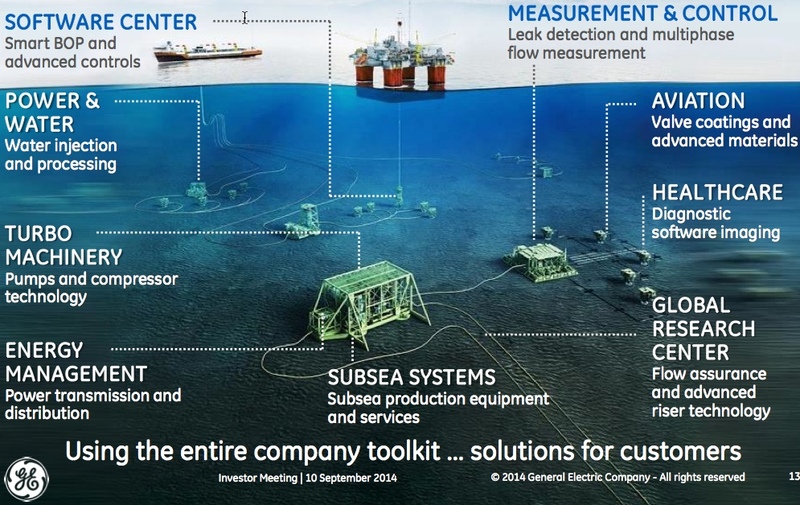 Technology is revolutionizing oil exploration and production. In the 1970s, the problem was to develop the mechanical structures that could survive the rigors of the North Sea and other deep water sites. The off-shore technology conference held in Houston in 1975 was typical of this era, where the exhibits primarily depicted the immense size of the structures and equipment used in deep water exploration and production. Today, the emphasis is on new technologies covering the spectrum of both offshore and onshore installations. New technologies are improving the industry’s ability to successfully locate oil and natural gas, and increase the amount of oil produced from each new well, while making every well safer and more environmentally friendly. It’s a revolution that’s not widely understood by the public. While some of the following was derived from GE’s public presentations, other sources have also been included. Imagine drilling where the ocean floor is 8,000 feet below the surface, and where the drilling depths are three or four miles beneath the ocean floor. Moored to a buoy at these wells, a ship will be able to process the crude as it is brought from the well. The ship, a floating production, storage and offloading vessel (FPSO), is moored to a special double hulled buoy, so the ship can rotate around the buoy and always face into the wind. The FPSO ship can be disengaged from the buoy in the event of a hurricane and the buoy can be automatically lowered to 150 feet below the surface so as not to be affected by the wave motion caused by hurricanes. Pipes within pipes are laid on the ocean floor between the manifolds and trees. The outer pipe is 14 inches in diameter, while the inner pipe is 9 inches in diameter. Joining these pipes requires an understanding of the differing tensile strengths and coefficients of expansion. Barriers are also welded between the inner and outer pipe, to create chambers to catch any oil that might leak from the inner pipe. The risers are 9 inches in diameter with wall thicknesses of over an inch, containing oil and gas under high pressure, perhaps 10,000 psi. Attached to each riser is a “can” filled with nitrogen to help support the riser. These buoyancy cans are 120 feet long, which is the height of a ten-story building, and 21 feet in diameter. The weight of the oil in the riser creates sufficient pressure at the wellhead, 8,000 feet below the surface, to slow or stop the flow of oil from the well. 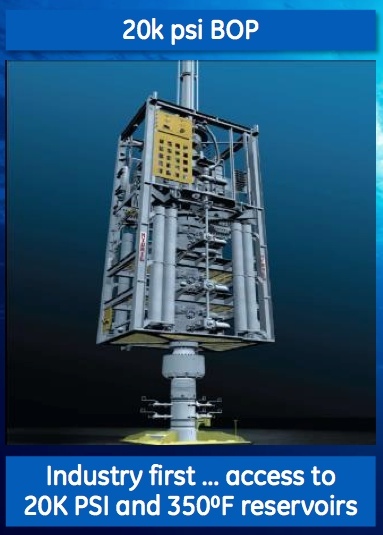 To ensure the proper flow of oil up the risers and to the FPSO, electrically powered booster pumps, connected to the risers, are laid on the ocean floor to assist the natural flow of oil caused by pressure within the well. Blow out preventers, that received ostracism when the Macondo well failed, have been vastly improved. The following from GE depicts the breadth of technologies used on the ocean floor. While onshore, new technologies are being applied to pipelines, drilling and fracking. GE has announced an intelligent pipeline management system, to monitor the operation and safety of pipelines. Flow meters, based on GE’s medical systems ultra sound and MRI technologies, can be attached to wells to continuously measures the sand, oil, water and gas mixture coming from the wells, superseding monthly, batch type analysis. Using jet-engine materials and technology in coatings and corrosion resistance, and modern manufacturing methods, such as 3D printing, to improve reliability and performance. Capturing natural gas that would have been flared, and then using CNG and LNG technologies to use the gas to power equipment at the well site. While this article mentions GE, the entire industry is developing new products, technologies and procedures, such as improvements in fracking from longer horizontal wells, increased use of frack sand and increased number of fracks at each well. A future article will focus on fracking improvements. New technologies are making the exploration and production of oil and gas more productive, safer and more environmentally friendly. An excellent summary. The advancements in technology in finding and developing oil and gas is truly breathtaking. Thanks for writing about this. Your presentation is just one example of how competitive private enterprise can make a significant difference in increasing energy supply or other human needs. An interesting fact is how the media extol the technology of the cell phones while totally ignoring developments like the deep water offshore drilling you write about in this article. Thanks. I like your cell phone analogy. The media is committed to its view that climate change is caused by CO2, so it ignores technology developments that enhance fossil fuel development or use.